As an electrician I have seen many improvements within our industry, but for me the one that has had the biggest impact is LED lighting. The changes within the LED lighting industry over the last twenty years have improved lighting for both electricians and consumers alike. Since the turn of the century LED light fittings have become the number one choice for electricians. They are versatile and tick all the boxes in terms of the variety of design options available and efficiency for our customers. Here’s some examples of how LED lighting has improved the face of domestic and commercial lighting. LED lights have a much lower running temperature resulting in a reduced build up of heat within the light fitting. This helps to significantly reduce the risk of fire as the fitting doesn’t overheat like a standard light fitting would. This reduction in heat is also safer when light fittings are in easy reach of children and family members. LED lights can flood a very large area with light for a fraction of the running costs of standard light fittings. We recently replaced some tired 400watt metal halide units with 200watt LED units, and the light improvement was significant. 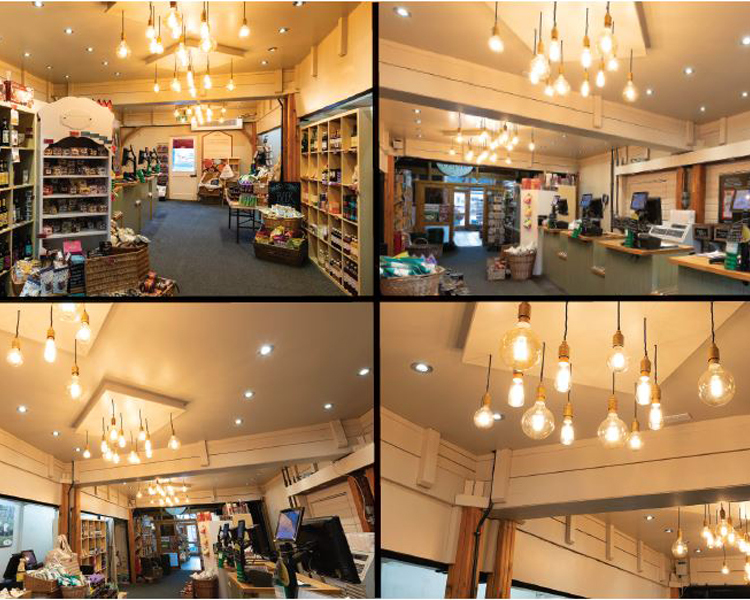 The installed LED lighting resulted in an improved working environment and happier workforce, plus a 50% reduction in the running costs for the business. When compared to sodium, metal halide and halogen lamps the life expectancy of an LED light is significantly longer, resulting in much lower maintenance costs as the number of lamps needed is hugely reduced. Most LED lamps have a rated life of 50,000 hours, this is approximately 50 times longer than a typical incandescent and 20 – 25 times longer than a typical halogen. If used for 12 hours a day, a typical LED lamp will last 11 years. The range of colour changing options with LED is vast, offering a full spectrum for customers to choose from. For example, if you wanted to floodlight your home or office pink it can be done with LED lighting. We can instantly change the mood or feel of a room by changing the colour. In recent years the old squirrel cage lamp has made a return. LED’s have enabled the lamps to not only look great but also have a lower running cost. The LED bulb offers customers the benefits of LED but also a retro design if that’s the look they require. The options when it comes to decorative LED lighting really are endless.